Right or left, which one is it? Andrew Bolt has made a habit of talking of “Left fascists“. But fascism historically was a regime of the Far Right. Really? Hitler led the National Socialist German Workers’ Party and Mussolini was editor of Italy’s national socialist newspaper, Avanti. We are socialists. We are the enemies of today’s capitalist system of exploitation … and we are determined to destroy this system under all conditions. Socialists splutter that Hitler and Mussolini didn’t represent their socialism, which is of the cuddly kind embraced by, er, Lenin? Or they say these tyrants perverted it, or changed their mind. But the point is that both did what many socialists still do – treat individuals as mere representatives of collectives, and make their individuality second to the great collective goal. The individual is sacrificed to the International, to the Fatherland, to the Dictatorship of the Proletariat, or, now, to the planet. Yes, these various sects do fight among themselves, but sibling rivalries are always the most bitter. 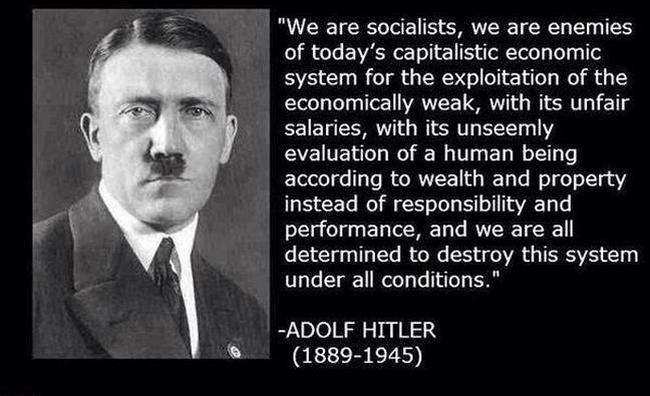 Hitler, Stalin – same MO, and same bloody results. They just had different names for their gods. One final feature of a fascist (although, again, not she or he alone) is their feeling licensed to use language with scant regard for consistency, clarity or accuracy. ‘Right or Left. Which one is it?’ This is an incredibly important question, and one that no one is bothering to answer. Left Wing is Socialism – the State controls everything and everyone. Under Socialism, the individual has no value, and counts for nothing. In the Socialist State, each member of the Proletariat has an equal share of misery. As the bitter little joke being whispered throughout the old Soviet Union had it: ‘Have we reached full Socialism yet, or do things have to get worse?’ But ‘the Right’ is the polar opposite of ‘the Left,’ in the political spectrum, isn’t it? Therefore, logically the Right must be the complete opposite of total State control over the lives of individuals. Therefore, the ‘Right’ must be the antithesis of any sort of State control, devolving down into some sort of classical Anarchism – not the absence of any State control at all, necessarily, but a situation where the locus of State control vests not in the State, but within each individual person. The American Declaration of Independence hints at this philosophical position, with its assumption that political power always vests in the individual, and the individual must willingly delegate this power to the State. The State can only govern with the consent of the governed. But no! No! No! No! 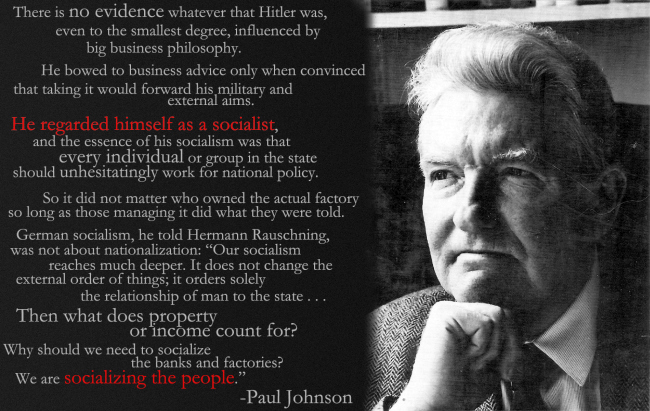 We are told that the opposite of total control of the individual by the State through Socialism is total control of the individual by the State through Fascism. We are just changing labels. The all-powerful State remains in control. Well, none of this makes any sense to me. I’ve now been dragged unwillingly to the conclusion that ‘right Wing,’ ‘alt-Right,’ ‘far-Right’ are all meaningless terms of abuse, that those on the political Left hurl at anyone who has the temerity to disagree with their perspective of the Universe. Like most University academics, the space between their ears sounds like a blow hole. These overpaid, over expressive and over believed teachers of our children should keep their collective leftwing beliefs to themselves and stop indoctrinating our children. There is the right hand and the left hand of thought, there is right and there is wrong and it is up to the individual to make that decision for themselves. All thought should be debated in a adult way without intimidation or threats of violence to those who do follow your beliefs. Debate on any subject should be embraced and acted upon, not shut down just because it does not agree with somebody’s political, social or economic beliefs. Mindless demonstrations and denying people the right to hear who they want, debate who the want and make up their own minds on any subject makes the rabid left the very thing that they themselves protest about. Hypocrisy within the leftist University fraternity knows no bounds. Review the Declaration Of Independence!! How can you live and be free if you can not own, use and enjoy real & personal property? How can you be free and support yourself if you can not retain the fruits of your labor? All forms of collectivist, totalitarian, authoritarian government must go to Hell and remain there! That includes Communism, Isdamn & Socialism. Censorship, book burning & thought control belong to Nazism, fascism & Communism. Efforts to stifle debate must be resisted with maximal effort. All forms of identity politics must be rejected including racism, Niggerism, Feminism & Queerism. The intention of the purveyors of identity politics is the establishment of totalitarian regimes. The perfect and total hypocrisy of Antifa & BLM must be called out and condemned!! !